The Blue Ridge Apartment Council (BRAC), a non-profit organization, is the largest association of rental property owners in the Charlottesville, Virginia area. Members are committed to providing excellent housing opportunities for students and townspeople alike. 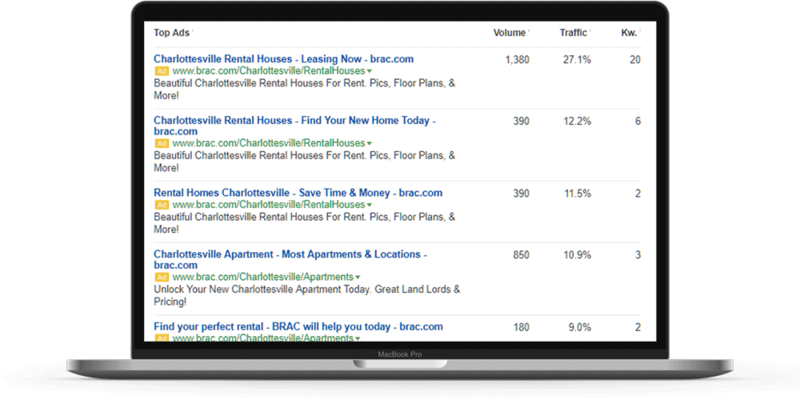 BRAC is a body of apartment owners in the Charlottesville, VA area that works to ensure the success of each of its members. However, as the apartment industry continues to become more competitive, BRAC needed help to ensure their online presence and attract qualified leads for their individual member apartments. 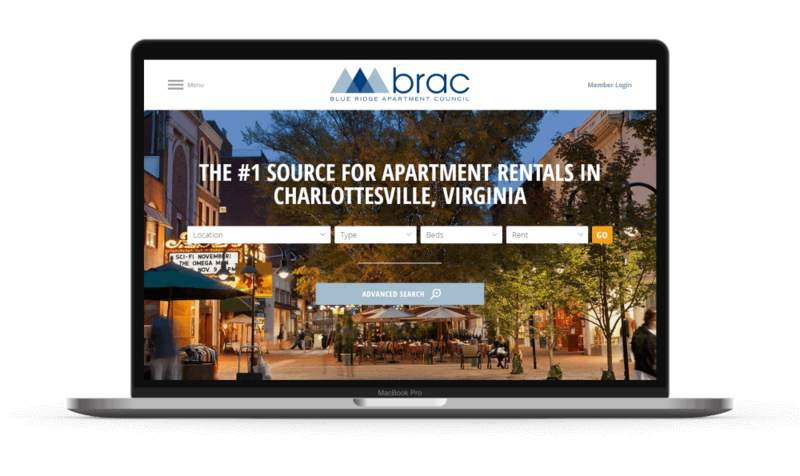 BRAC is a body of apartment owners in the Charlottesville, VA area that works to ensure the success of each of its members. BRAC knew the rise of competition in the apartment marketing space was getting more and more expensive. The aim was to drive a number of online reservations on their new website with SEO content for their landing pages. We worked with the leadership team at BRAC to create a highly focused PPC marketing strategy to attract qualified leads and increase qualified traffic to specific campaigns. We handled every aspect of BRAC’s PPC marketing needs, from research to campaign setups and ongoing optimizations. We did competitive research and market analysis studies to find the best keywords to focus on based on the needs of BRAC’s target audience. This information was vital to help us optimize the campaigns and ad copy to meet the needs of their demographic. These efforts resulted in increased traffic and more bookings for BRAC and their partners. Enjoy BIG business growth with proven PPC marketing strategies! The Charlottesville apartment market is growing at a fantastic pace as the University of Virginia, and other economic drivers are causing a revival for the local area. This economic growth has spurred the growth of apartment complexes across Charlottesville, which has put increased pressure on BRAC to drive traffic for their members. Together with their web development team, we produced quality SEO content to meet the needs of their audience. Along with amazing website content, we also spearheaded the PPC management campaign for BRAC’s online marketing strategy. Our knowledge and expertise allowed us to develop content to improve organic traffic and improve the Quality Score of BRAC’s PPC campaigns. BRAC knew that their members needed more bookings through the website, so we worked with the BRAC leadership team to build an optimized PPC campaign to meet their needs. We used market and competitive research to create customized ads and keyword sets based on what BRAC customers are searching for. We developed several campaigns and ad groups around specific themes and aligned the keywords, ads and ad extensions to the landing pages to ensure the highest performance possible. The optimized PPC campaigns that we created for BRAC have already shown success for their partners. Since we worked with their PPC campaign and SEO Copywriting BRAC has already received an increase of 17.25% Sessions, 18% Users and a substantial boost in revenue. We may be small, but we help our clients grow big profits through focused PPC management & copywriting strategies!